One Justice League hero talks about his appearance in Batman v Superman. Adrianne Palicki explains how long we can expect Mockingbird to stick around Agents of SHIELD. A Supernatural spinoff is still in the works. And could James Wan direct the Shazam movie? Spoilers now! I didn't know the extent to which DC and WB had planned on taking my character. When I signed on, I just wanted to be part of this world. But that specific information, I found out then and there. I didn't think I'd be getting my own stand-alone film. Head to Entertainment Weekly to read a round up of all the rumors that have been flying for season five. 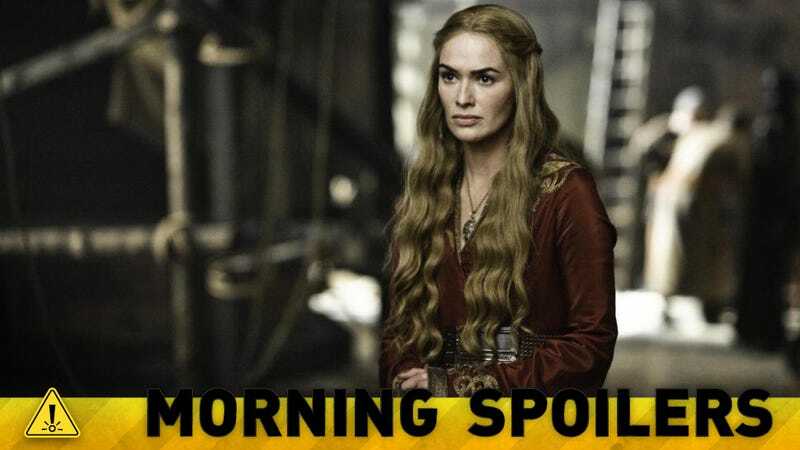 A bunch we've featured already, but some newer ones include hints that the Iron Islands will not be featured in season five, a certain character who returns from death in the books is still not returning in the show, and neither Clegane brother has been confirmed dead. That is up in the air still. She is part of the S.H.I.E.L.D. team. In episode 206, the world turns on S.H.I.E.L.D. because Hydra poses as them and attacks the U.N. All those story lines are still going; she's just now a part of that world. There's going to be a fun dynamic. A little bit like a Mr. and Mrs. Smith-type thing happening. It adds a little bit of levity and comedy to some very intense situations down the line. It's fun. Getting to play with Nick is just so entertaining. It adds a little bit of a different dynamic to the show. ... I think anything is possible with the past. [Her chemistry with Tripp] like that moment she has with Mack (Henry Simmons). They used to work together. They're really old friends. What it is more than anything is to show she's had a relationship with these people for a very long time. The support they give us is incredible. I think there's a real opening if we can come up with it. ... Our feeling on the spin-off is we want to do it if the idea is right. We want to do it if it's something we're really excited about and it's a corner of the universe we haven't seen yet. We don't want to do it just to jam a piece of business through. We want to do it if we're going to come up with something that's as good as the mothership… Me and [executive producer] Bob [Singer] and Jeremy [Carver] and stars Jared [Padalecki] and Jensen [Ackles], we all decided that it just has to be idea first. If it's not an idea that we're all totally in love with, we're not going to do it. It is a meaty episode for Diggle and, yes, there are going to be some long-lasting repercussions. That recurring theme of A.R.G.U.S./Suicide Squad/Diggle will be mentioned yet again. That's something the producers really want to play with this season. We really hinted at Diggle and the Suicide Squad and A.R.G.U.S. last season, and it got a big response. Again, where does Diggle fit into that organization? We're going to touch on that this episode and the repercussions of that will be played out later on this season. It's funny — Diggle comes off pretty humorous in the crossover episode. His reaction to Barry's superpowers is nothing short of hilarious. We get to explore that a little bit. Central City is light and airy and there's sunshine and sunrays and beams of light everywhere. Starling City is this dark, broody place. We come there with this weight, this crime-fighting, "How do we solve the crime and find our man?" type of attitude. We're met with this light and airy Central City, where it's, "We name our bad guys little fluffy criminal names." That drama all by itself is funny. But Diggle's reaction to Barry is a real treat. He's very surprised at this world of superpowered humans in Central City. Her mother is responsible for her father's death and that's kind of a big deal and they never resolved that. It's going to be really fun and interesting to see how they deal with each other. For Abby, the last time she saw her daughter, she was a scared little girl and now she's a fierce, strong woman. That's going to be a bit of a struggle for her to come to terms with in how much Clarke's changed. ... These kids have built a society from scratch on earth and having these adults come down and tell them how it's now going to be is really difficult, especially since the kids do know more than the adults in this stage of the game. They've experienced so much more than the people from the Ark have. In order to show Elijah (Daniel Gillies) that her plan is what's best for him, Esther forces him to relive a time long ago when he loved a young woman named Tatia (guest star Nina Dobrev). With the help of Marcel (Charles Michael Davis), Hayley (Phoebe Tonkin) is determined to find Elijah, who has gone missing, but is torn when she discovers that Klaus (Joseph Morgan) is also in trouble. Elsewhere, Cami (Leah Pipes) finds herself in a dangerous situation when Mikael (guest star Sebastian Roche) takes her hostage as a way to lure Klaus to him, and Davina (Danielle Campbell) makes an upsetting discovery about Kaleb's (guest star Daniel Sharman) true identity. Lastly, a violent confrontation ensues when Klaus comes face-to-face with Mikael. The women of the Freak Show rally against Dell after his latest act of violence. A strange encounter with Dandy raises Jimmy's suspicion about the clown murders. Written by Crystal Liu; directed by Anthony Hemingway. Here's the trailer for "Going Rogue," episode 1.04.